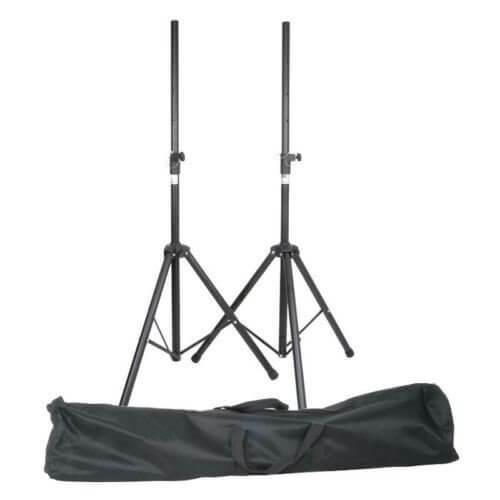 Brand New Heavy Duty DJ/PA speaker stand x 2 with FREE bag. A steel 35mm Speaker Stand. Finished in black powder coating. Adjustable height from 1230mm to 1980mm. Load capacity 35kg. Brand new with 12 months warranty as standard. Excellent build quality and design, but the powder coating was too thick which prevented the speakers from fitting on the poles, had to file down the powder coating. The team at Simply Sound and Lighting are really pleased to hear you’re happy with your new QTX Speaker stand Graham, Thank you so much for your valuable feedback! Thank you for the tip about filing them down- will pass that on to the manufacturer.